For the past four seasons, CBS’ Person Of Interest has made an action-packed and surprisingly thoughtful series out of the question, “What if humanity created an artificial intelligence capable of preventing crime?” From that initial technology-hewing version of Minority Report, Jonathan Nolan (brother of director Christopher Nolan, who cowrote many of his sibling’s films, including The Dark Knight) and Greg Plageman have developed a complex and compelling story about the human cost of scientific evolution. The A.V. Club spoke with the two executive producers of the series as it enters its final year this week, with a shortened season and a schedule of twice-a-week episodes airing on CBS. Nolan and Plageman held court on their favorite character pairings, how to smuggle human relationships into a computer, and the belief that nobody thinks they’re working for an evil company—even Facebook employees. The A.V. Club: Since the beginning, this show that’s ostensibly been about artificial intelligence is really about human connection. What’s it like to thread that needle and how has it evolved over time? AVC: One of the great things is how you were able to connect to The Machine, even on a very personal level. The Machine was gendered female, whereas Samaritan has stayed relatively genderless. Can you expand on that? AVC: It seems as though The Machine went through a rebellion phase when it really started to only speak through Root. Will this season be about The Machine becoming more mature in that sense and answering to everybody? AVC: Do you think that if we had been watching the team behind Samaritan from the beginning, rather than the team behind The Machine, that we would be pro-Samaritan? AVC: Everybody believes in their own machine, right? GP: Right. They were both sort of preaching a fealty to a greater god, an ASI, only they were different machines. And in the penultimate episode of this year, we actually show people what a world would look like had Harold Finch never built his machine, if there was only Samaritan, which is kind of fun. There’s an exciting new director on that one. AVC: While we’re talking Samaritan, did you always know that Samaritan was coming? The show started off as more of a procedural, but did you always know you were going toward this more complex world? JN: It’s funny, because the perception of the show is that it started out one way and then changed. From our perspective, the show was always and remains exactly the same thing. We targeted The X-Files as a blended model of engaging story-of-the-week storytelling, which is one of the things that is pooh-poohed now in the cable age, where every show has to be a novel, and it’s sort of self-evident that will go away at some point soon. If people want to get 60 minutes’ worth of engaging television they don’t have to tune in every week for—it’s an engaging and durable model for TV and it was a model for TV for 40 years, the “procedural.” So for us, we embraced The X-Files, it was a great show. Buffy—you could point to show after show that threaded the needle on broadcast when there was no cable model. I think we’re going to tell an engaging story every week, but we’re also going to slowly, piece by piece, build a bigger storyline. Greg and I sat there in a hotel in New York, shooting the pilot and figuring out, how is this an ongoing enterprise? How is this an ongoing TV show? Why are people going to tune in? How do we do 22, 23 of these a year and keep it engaging? That’s our model of the blended approach: case of the week and the long-form storytelling, which gives you a real advantage in broadcast. If you try to do 22 episodes of serialized content a year on broadcast, you’re going to wind up a soap opera. You’re going to run out of good story. You’re going to burn story just because you have to do 22 episodes. Some of my favorite episodes are episodes that don’t necessarily tie into the larger storyline. So for us from the beginning, it was always, “Episode two filmed in a flashback of Finch’s backstory. Episode three steps up and allows you a glimpse of Enrico’s character.” The formula has been exactly the same, and the last season is no different. We didn’t want to abandon the approach at the last minute. That would dishonor the premise of this show that’s about faith and ordinary people. That’s the franchise of the show; that’s what it’s been since the beginning. We became a little more confident in the larger story we were telling. And the larger story we were telling grew naturally as, episode after episode, all the writers working together stacked one more layer of complexity. And I think by season three we had like 16 villains. [Laughs.] There’s a point where you have to cull a little bit. But the complexity came naturally. That was our approach, and it’s always been pretty steady. AVC: This kind of storyline has popped up a few times lately in pop culture, in films like Captain America: The Winter Soldier and Ex Machina. Do you feel like these films are treading on ground that you had already staked out? 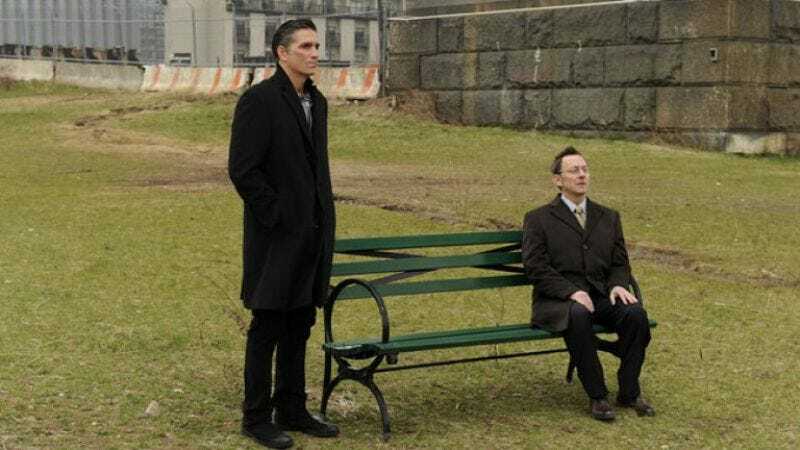 Did it have any future bearing on Person Of Interest storylines? JN: [Laughs.] I don’t know. We tried not to be reactive, and that’s one of the things that’s unique and cool about TV versus film. You’re making the thing as people are consuming it, watching it, telling you what they think. And if you’re not careful, you can derail yourself by responding too much to that. It was engaging and flattering to see some of the ideas from the show potentially filter into other shows and films, but I think everyone’s kind of looking at and thinking about the same stuff, that AI is at the forefront for people. What was more alarming was watching the real world come into the space of the show. That was not flattering so much as terrifying. AVC: When you got the half-season order versus the 22 for the final season, were there any storylines that you had to compress or cut altogether? GP: There’s definitely more story we could have told, and there’s more depth we could have gone into in some of our character examinations, but I think in an odd way, reduced story was kind of freeing. It felt like we could really tackle one big arc and do it in a compressed way that was extremely compelling. And I also think the audience is going to benefit from the fact that they’re airing two of these episodes a week now. So even though the schedule is more compressed, you don’t have to wait as long to get to the next one. The more serialized aspect of the show will become more apparent and riveting. AVC: Since we only have a minute left, let’s do a lightning round. Who are your favorite character pairings? JN: [Laughs.] Finch and Root. Greg, who is it for you? GP: I always found Reese and Zoe kind of fun. JN: Yeah. The only tricky thing with all the recurring actors was we never had them on a contract to get them back, so we kind of had to thread the needle there. Paige [Turco] got busier and busier and it was harder and harder. GP: I definitely enjoyed writing for Enrico [Colantoni]. Enrico and anybody. AVC: Who has the best throaty voice? Is it Shahi or Caviezel? JN: Who has the best what? JN: [Laughs.] Greg, you’re going to have to answer that. GP: I guess it depends on your persuasion. AVC: Last question: How much do you love Bear [the dog] on a scale of one to 10 Bears? JN: Oh, god. Not enough Bears in the world. GP: Bear made it a family. JN: Yeah, he’s pretty amazing.